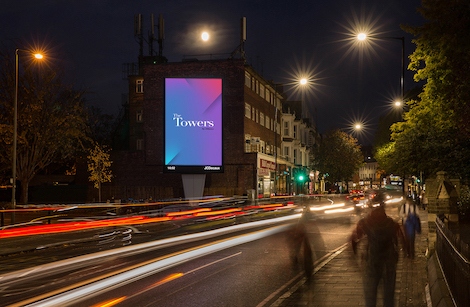 JCDecaux this week announced a further expansion of its National Towers Channel, a network of high-quality digital screens in premium advertising locations across the UK. 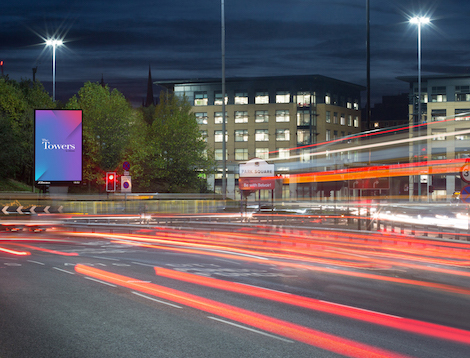 Providing an unbeatable presence in six major UK cities: Manchester, Liverpool, Birmingham, Edinburgh, Leeds and Sheffield (shown above), the 12 state-of-the-art screens generate a combined 8.5 million weekly viewed digital impressions. Each Tower is architecturally designed to provide a brand safe environment, while the high resolution 10mm pixel pitch screens provide unbeatable quality for brands. The new Sheffield Towers are positioned on Park Square Roundabout, a key arterial route into the heart of Sheffield city centre. In London, JCDecaux has also added The West Cross Tower, located close to Westfield shopping centre and The Putney Tower (shown above) which reaches a highly affluent south west London audience travelling into the city. Further additions, The Westminster Towers and The Great West Road Towers, will be live by the end of the year. The London and national locations together create a compelling Towers Channel that delivers 43 million weekly viewed digital impressions across the UK’s top cities. This entry was posted on Friday, November 17th, 2017 at 11:15 @510 and is filed under DailyDOOH Update. You can follow any responses to this entry through the RSS 2.0 feed. You can leave a response, or trackback from your own site.